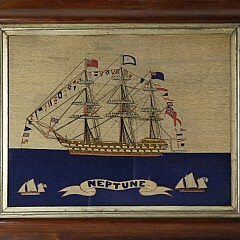 Size17 in. x 22 in. 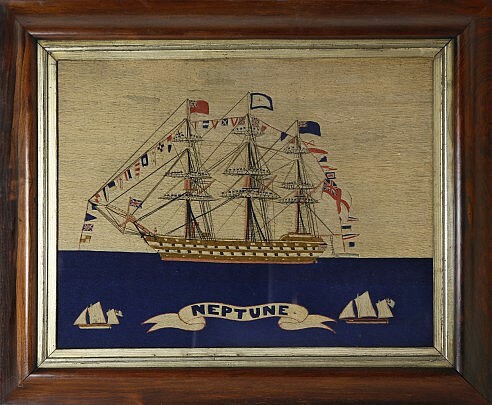 19th Century British Sailor’s Woolwork, circa 1832-1859, depicting the portside of a 72-gun Man-O-War with sailors in uniforms manning the yardarms and dressed in flags during their ceremonial entry into port, a banner “Neptune” below on a deep cobalt sea, flanked by pilot boats, in a period molded rosewood frame with gilt liner. Overall 24 in. x 29 ¼ in.